The start of October saw the WSL Quiksilver and Roxy Pro surfing comp held in Hossegor. Last year, this also happened to coincide with #womeninsport week back home in the UK. Seeing the publicity around the event but being at the heart of the surfing competition in France got me thinking about how the WSL is on a totally different page to that of the UCI. This time last year, the UCI announced an “expansion” to the women’s world tour calendar including changes to La Course, the women’s version of the Tour de France. Moving away from the crowds of the final day in Paris , the ladies would race a mountain stage the same day as the men. Just, not as long and they wouldn’t race to the top, because, you know, women aren’t capable of that. And, with a kind of successful (if not a little odd) 2-day stage completed back in July, you’d think this could only mean great things for 2018… but think again! Only yesterday, the ASO announced it was reverting back to a 1 day race for the ladies. When you look back and realise there was a separately held version of the tour with 18 stages intermittently held between 1984 and 2009, it’s hardly an advancement to the sport is it? I’ve followed surfing on and off since I was a teenager, winning the opportunity to learn with O’Neill in a competition I randomly entered having picked up a leaflet in a shop. I don’t ever remember considering surfing to be any different for a girl than it is a boy. Unlike I did cycling, watching the Tour de France year-in-year-out with my Dad. No wonder I didn’t buy my first road bike until I was well into my 20s. Being at the heart of an event that doesn’t treat a sport any different just because there happens to be women in the water instead of men is inspiring and a little breath taking. The number of spectators gathered on the beach to watch the Quik & Roxy Pro didn’t differ either – everyone there to watch a sport; my boyfriend admitting he probably knows a lot more about the female surfers because of duel-eventing than he would if it was held separately (let’s not talk about the “advertising” here). And I certainly didn’t feel the need to run down the beach flying the #womeninsport flag. All of the competitors were just that. Competitors. Although women’s surfing hasn’t always been treated on par; it has it’s issues and some would say it’s still not good enough, the work that has been put in over the last 15 years has meant that where they are today is light years ahead of cycling. Last year, the WSL announced and held the first Titan’s of Mavericks women’s event; a one-day invitation only big-surf competition in which 6 women competed in an hour heat to win a coveted $30,000. This was astounding news to the big-wave women surfers who’d previously been left out of competitions like this. The good news, is Maverick’s has been added to the Big Wave Tour this year. Women included, obviously! And, with a recent change to leadership at the WSL, it’s refreshing and pretty exciting to see a woman running the show. So with this in mind, here are 4 things I think the UCI and competitive cycling could learn from the WSL. Unlike most road cycling events, the women’s and men’s competitions not only run side by side , at the same venue (except a few tour locations for women or men only events) but co-held depending on the situation on the day. A little like track races, you could be watching the Women’s heats in the morning, the men’s in the afternoon, followed by the men’s again the following morning. Even the conditions of the competition are the same. Just because they’re girls, doesn’t mean they get (read: need) longer/shorter time in their heats, unlike some sports. This also goes for the naming conventions of competitions. Here in Hossegor, the men’s is referred to as #QuikPro and the women’s, #RoxyPro. With some good branding, job done! The organisation of the event also means one audience for an inclusive competition. There isn’t a “women’s” version of the WSL handling the women’s events. It’s all homed by the one organisation. Inclusive. Much like cycling, the WSL events travel all over the world throughout the year and to some quite otherwise un-accessible locations. You’d have to be rich and have a lot of time to follow that lot around or work for them (I wish!). 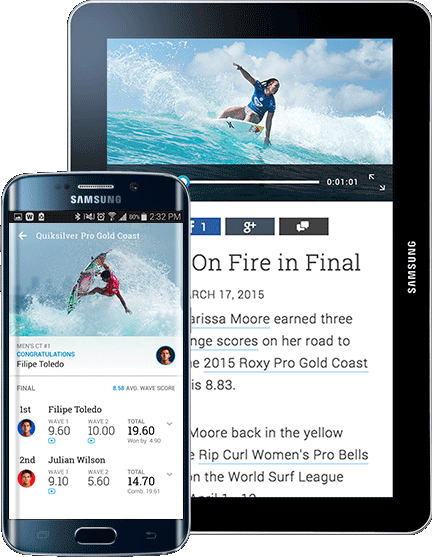 WSL don’t (currently) sell the rights to individual events or heats to paid-for TV channels. They certainly don’t broadcast the men’s heats in full and only show a snippet of the women’s overlaying the mens. Nor do they show replays at silly times in the day. Ahem! Instead, their dedicated website and mobile app is home to everything you need to know about the event and the competitors. Best of all, it’s open to all. No location based access issues. No pre-pay requirements or licenses (for now anyway, there are rumours that some or maybe all live-streamed events could go behind a paywall due to sponsorship & advertising challenges). From real time heat / score updates, a dedicated morning show with animated presenters (including, shock-horror, a woman), continuous streaming of the event as it happens, when it happens, and all inclusive, technical and *non-patronising* commentary, it’s refreshing to say the least! At this year’s event, I made a purpose to look at how both events were reported. Taking a quick flick through the WSL’s app-news and twitter feed, there was no bias in language or limited number of column inches. The women’s event wasn’t hidden in two lines of text on the back page, down in the left hand corner, for example. On days where only the men’s or the women’s heats were held, there was obviously more news for such, however each competition is clearly as important as the other. And there’s certainly no gender-bias headlines. Surfing as a sport has strong foundations, but that’s not to say it hasn’t had its difficulties. It does mean it has long standing sport specific brands dedicated to its athletes. Just like the dual-run events, sponsors typically have male and female teams too. In fact, they’re often not even identified as M v F teams, but merely, their team. Roxy was launched in 1990 as a dedicate brand for women. Although the branding may be ‘girl’ specific (note the (ok, slightly patronising) pink flags and markers flying at the event), the heart of the brand is the same regardless of which logo is being flown (makes the logo even more fitting). With a very successful women’s team, it’s clear they value this side of the fence as much as they do the other. Every year at the Quik and Roxy Pro, all the sponsored teams hold meet and greets with the teams in their stores in the town centre. What a lovely way to thank the fans for their support. Ah the bug bear! So, the money isn’t quite like for like for the winners at the Pro and is still a debated topic; the mens events are typically bigger in terms of competitors than the women’s to which WSL argues “pay parity has already been achieved because the average prize money per surfer is $15,306 for men and women”. At least they’re not hiding the disparity; the earnings of each competitor openly published on the website. But things are changing. The big wave event, La Vaca Gigante sponsored by Oakley announced last year a matched prize fund for the newly added women’s event. That’s what we like to hear!